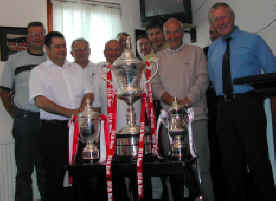 with the OVD Scottish Juniour Cup, East Super League & North End trophies. Click the above picture for a full size version, allow time for download. 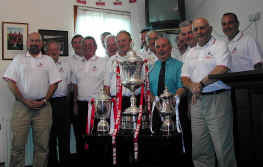 Hospitality is available for individuals and groups of 2 to 24 on match days at the Canniepairt. Ideal for small business, groups of friends and the like. There are pre-match drinks, three course meal, pre-match chat with the manager, match programme, half-time refreshments, man of the match selection and presentation post-match and post-match chat with manager and coaches. £25 per person, details are available from Tom Borland Telephone 01382 553249.